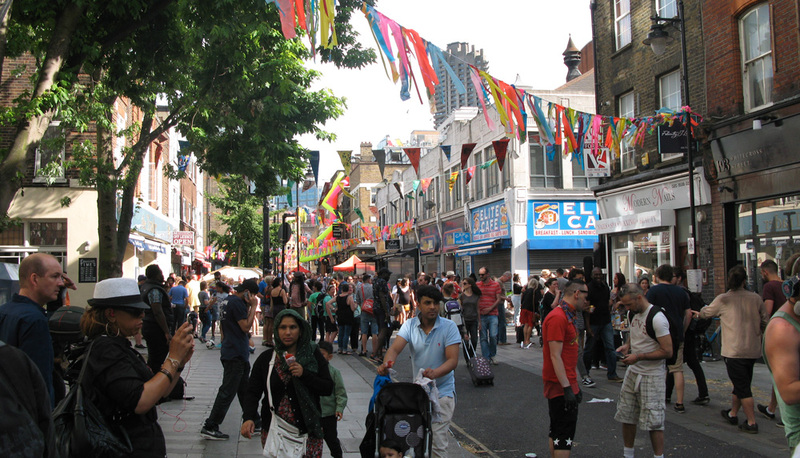 The Whitecross Street Party, a one day event which has been taking place in East London for the past six years, gathers street food, families activities, live art and music in a friendly atmosphere. 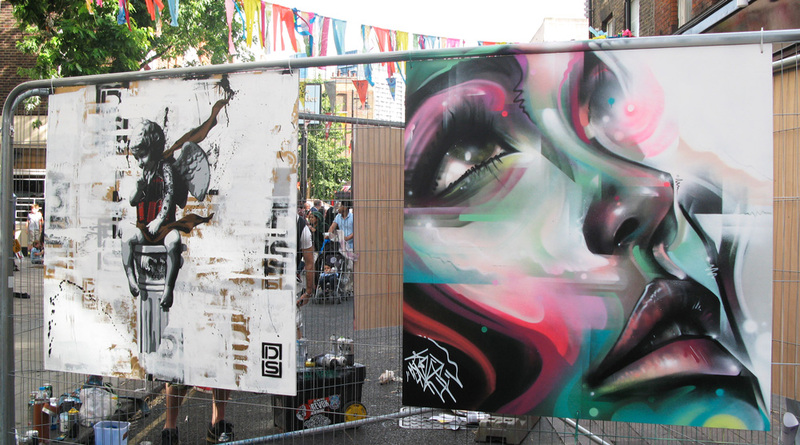 This year, 40 street artists joined the party. The panels which were spread across the area have now been hung up on the walls for people to enjoy for the next two months. 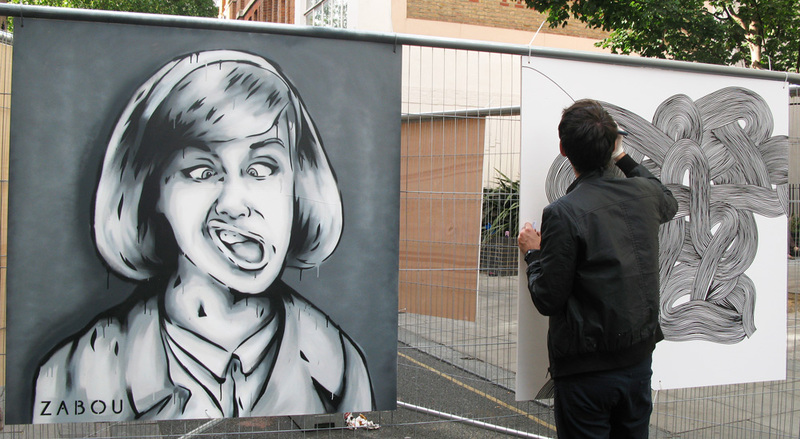 The piece I created, cheeky and funny, features a girl doing a funny face. She is well dressed, as if it was an old portrait, and I can imagine her suddenly pulling up that incredible face while her photo is being taken. Kef! painting next to me. London has been facing many major changes in the last few years, one of them being gentrification taking place in many areas around the capital. The phenomenon triggers drastic rent rising, less affordable housing, old buildings being taken down to be replaced by luxury flats, families struggling, old and young people having to move out etc. It has become difficult to be able to afford living near the centre, as well as buying a house or a flat. This is an issue that many people I met are facing, I have myself to move out from my flat as the rent is rising up to £900 per month (!). Hence why I painted this portrait of a girl carrying a house, her home, in her backpack. I’m not sure what the future holds, but something needs to be done to stop this madness. The district of Whitechapel in London is famous for the legend of Jack The Ripper, an unidentified serial killer who committed a series of murders in 1888. The Bell Pub invited me to paint their front wall ; the mural depicts Jack as a man hiding in the darkness, holding a knife covered in blood, with the words “Catch me if you can” written on the side. A fake (of course) blood stream was added onto the pavement to add to the gloomy scenery, allowing visitors to pose as victims in front of the piece. Number 90 is a bar and venue by the canal in Hackney Wick, East London. I painted two characters climbing and trying to escape on one of the walls, and used a chair and a brick that were around to make the piece even more interacting with its environment.